Google Analytics is awesome tool to know more about your website, traffic, and user behaviour. This guide will quickly get you started with Google Analytics. Here is the list of use cases supported by Reporting Capability in Google Analytics. Compare metrics– User can compare and plot graph for 2 metrics. User can add metric in the report for comparison. Adding additional dimension for reporting –User can add a secondary dimension in any report to analyze data against 2 dimensions. (For example, user can add country in language report to analyze country wise data for languages). Sort report –User can click on any column to sort data on a particular column. Viewing report in multiple formats –User can choose to see report in multiple formats. Formats included are Table, Pie chart (showing percentages),Bar chart (Performance/Comparison) and Pivot. Changing Visualization frequency –User can choose to see visualizations in daily, weekly or monthly frequency. Changing visualization –User can choose to see visualizations in Line chart or Motion chart. Apply Advance segment –User can apply advanced segment for filtering data before report is run. User can choose to apply default segment (e.g. Search traffic) or can create custom alerts for any dimension. Schedule email report –User can schedule to email reports to any email id. Export reporting data –User can choose to download reporting data in selected formats. Formats available are CSV, TSV, Excel, Google Spreadsheet, and PDF. Add to dashboard –User can add any report to dashboard. Add variant –User can add report variant as shortcut for accessing later. Selecting date range –User can change date range for report by clicking on date range. Comparing date range –User can add 2 date ranges for comparing data in 2 date ranges by clicking date range. Refresh report data –User can choose to refresh report data while running the report. Customize standard report –User can choose to use standard report as reference for creating custom report by clicking on Customize button in standard report. There are 2 ways to create custom reports in Google Analytics. Clicking New Custom report tabs - This will take you to custom report creation wizard. You can choose dimensions and metrics for the report and save the report. For example – If you want to create a report that display number of new visits by country and language. You can click on new custom report, add Metric “New Visits” and dimension Country/Territory and Language. Once report is created, you can access it from Custom reports tab. Using Standard reports as template - Most of the reports can be used as a reference for using custom report. Go to any standard report. If report can be used as reference, you will see a Customize button. Clicking on the button will take you to the custom report wizard with metrics, dimensions, filters etc already available. You can add additional elements or remove already available elements. For example, if you want to create report discussed earlier (number of new visits by country and language), you can use Language report (Reporting -> Demographics -> Language) and click on Customize. You can add additional dimension Country/Territory. By default reports are sorted by metrics selected, but you can click on any dimension column to sort by any dimension. User can choose to send reports thru email to any email id. Here are the options available for email scheduling. Frequency -User can choose daily, weekly, monthly, or Quarterly frequency. If weekly is selected user can set the day for email (Any day such as Monday or Friday). If Monthly is selected, use can choose day of the month (1st, 2nd third etc). Google has intelligently omitted 29th, 30th and 31st as these can cause issues with certain months. For example, if you choose 30th, you will not get report in February. This may be unintentional. Choosing people to send to –User can enter email ids of people they want to send report to. Subject Line– User can change the default subject to more meaningful subject line. Report format –User can choose the format of the reporting data (CSV, Excel, PDF). Validity -User can choose how long the schedule will be active. So, if user sets 6 months here, User will stop receiving emails for the report after 6 months. Google Analytics allow you create 2 types of custom reports from the same underlying data. Explorer reports –These types of reports are typical summarized reports. You add dimensions and metrics. If you choose more than one dimension, you can drill down to more specific data. Flat table –If you choose flat table, reporting data will be arranged in detailed format with selected dimensions and metrics as columns. Let us take an example. You want to see number of visits by country and then by language. You can create a report with dimensions Country/Territory and Language. You then need to add metric Number of new visits. If you choose flat table, system will generate a detailed report which will show number of new visits for each Country/Language combination. Examples of rows will be number of visits for USA and English, for USA and French, for France and English, for France and French etc. If you choose Explorer report, system will generate a report which will have summarized reports at country level. You can then drill down for language level data by clicking on country. For example, you will see a row for United States showing number of visits for USA. If you click on USA, you will be able to see Number of visits data for Languages such as English, French etc for USA. You can save variant of any report for future use in Google Analytics using Shortcuts. You have added additional dimensions in Standard or custom reports and you want to be able to use the same report later. You have changed sort criteria and you want to access the report later for running. Once you have customized any report, you can click on Shortcut button on report page. The report variant will get added under the Shortcuts on left side menu on Home Page. Google Analytics provides two ways to filter data that you see in the reports: Segment and Filters. Both Advanced Segments and Filter allow you filter data on reporting dimensions. For example you may want to filter data on Web Browser. Both Segment and filter allow you to do this. The key difference is Segment filter the data before report is run whereas Filters allow you to filter data while running the report. So, if you know that you only want to see data for Internet Explorer and Firefox, you can add a segment with the condition. But if you want to analyze and filter the data for Internet explorer while running the report, you can add a filter with dimension Browser. Dashboard in Google Analytics allows you to see multiple information points on a single page. Dashboard allows you to check health of your website from a single page. Add widget from dashboard– You can click on +Add widget from dashboard page to add new widget (Maximum 12 widgets). Add widgets from reports– You can click “Add to dashboard” button on any report to add widget to dashboard. Edit Widget– You can edit any widget by clicking on settings button on any widget. Once saved, you will start seeing newly updated view and data for the widget. Delete widget– You can delete any widget from dashboard by clicking on settings button. Re-position widget– You can drag and drop a widget to a new position. Share dashboard– You can share dashboard configurations with anyone. When you click on share button, a unique url will be generated that you can share with anyone. This will help save time with dashboard creation and customization. Email dashboard– You can schedule to receive dashboard in email. You can set to receive the dashboard on periodic basis such as daily, weekly, monthly. Export in PDF– You can download dashboard in PDF format. Add new dashboard– You can add new dashboard (maximum 20 dashboards). Rename dashboard– You can rename any dashboard by clicking dashboard name. The default dashboard is named “My Dashboard”. You can choose to rename this. Delete dashboard– You can delete any dashboard not required. When you add a new widget or when you edit existing widget by clicking on settings button in Google analytics, there are 4 type of widgets you can create. Metric –Here you can choose a metric you want to follow. 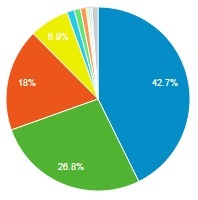 Pie –You can create a pie chart using the option. Here you select a metric and a dimension, select number of slices you want to show (maximum 6). Timeline –Here you show a line chart you want to follow. You add a metric to chart. You can also enter additional metric you want to compare against. Table –Here you can add a table with a dimension and up to 2 metrics. You can display up to 10 rows. In any format, you can choose to add filters, so that only filtered data is shown. You can also link the widget to a report. When you click on widget name, you will be taken to the report. The link is added by default when you add widget from report page using “Add to dashboard”. Why can’t I drill down to report from dashboard widget in Google Analytics? Usually, you should be able to click on any dashboard widget title to go to related report. This happens automatically when you create dashboard widget. For example, if you use “Add to dashboard” feature on any report, link to the report will automatically be added. However, if you create a dashboard widget from My dashboard page, you may not have added a link to report or url. If you leave the link field blank, dashboard widget title will not be clickable and you will not be able to drill down to report. To fix this, Click on edit button on dashboard widget and add URL of the report or any other link where you want to go once you click on widget. Google Analytics has a very strong and customizable alert functionality. Similar to standard reports and Custom reports, Alerts can be categorized into Auto alerts and Custom alerts. Automatic alerts - By default, Google Analytics generates automatic alerts when big variations are noticed. You can choose to monitor alerts online or receive via email or mobile. You can choose to receive fewer or higher number of alerts by adjusting alerts sensitivity. When you are seeing an alert, you can click on details to see additional details. From there, you can click on “Go to report” to see detailed view of report to analyze further. Custom alerts - In addition, you can create custom alerts. You can choose the dimension against which alert applies & metric and value to compare against. Whenever, the metric value condition is met for dimension, Google Analytics will generate an alert. You can choose frequency of alerts from daily, weekly and monthly. You can also choose to receive alert on email and mobile. Currently, alerts can be created for one dimension and one metric. Google Analytics come with rich custom alert functionality. Here are use cases supported. Create custom alert– User can create a new custom alert for any dimension and metric. Manage custom alert– User can manage previously created alerts. User can also create new alerts from Manage custom alert functionality. Edit alert– User can click on any alert from manage custom alert menu and edit any option such as name, frequency, dimension, metric etc. Delete alert– User can delete any previously created alert from manage custom alert menu. Add to profiles– User can activate alert for additional profiles. By default, alerts are added for the profile from where alert is created. Email alert to self– User can choose to get alert to email id registered with Google Analytics. Sending email alerts to others– User can choose to send alerts to additional email ids by providing the email ids. Mobile alert– User can choose to receive alerts at mobile phone. Enter condition– User can choose dimension and metric on which alerts will be based. User can enter value for dimension and metric selected. What is Concept of Profiles in Google Analytics? Profile is the way Google analytics organizes data. All Google analytics features such as reports, alerts, and dashboard are run on profiles. When you enter a site, a default profile is created. You can create new profiles and edit the settings to customize the data you want to see. Only the data selected as per profile settings is included in the reports, alerts etc. There is tremendous use of profiles. For example, you can change time zone settings at profile level. So, when you run a report on this profile, you can see reports in UK time zone by setting UK time zone at profile level. You can use profiles to exclude certain URLs from your reporting. You can always delete profiles you don’t need. If you have used any reporting tool earlier (What a stupid if condition, of course you have!! ), you will notice significant differences when you start using Google Analytics. One of such differences is “always on” feature. In traditional reporting tools, when you click on a report, you will be presented with the list of selection or filter criteria. Then you enter filter criteria for the data you want to see and run the report. Google Analytics reports are run the moment you click the report. So, these reports are on the moment you open the report. You can always filter the data by applying filter later and rerun the reports. Should you care for this? Yes, what this means is that you should use profiles and segments effectively to limit the data you want to see in the reports as segments and profiles are applied before report is run.